Prime Minister Sheikh Hasina on Sautrday sought the support of the university teachers in the coming election to continue the country’s current pace of development. “We want your support so that country’s present pace of development continues, as all our works, those we did from 1996 to 2001, were destroyed after the change in government in 2001,” she said. She was addressing a ‘University Teachers’ Conference’ organized by the Federation of Bangladesh University Teachers Association (FBUTA) at Bangabandhu International Conference Centre here. The prime minister said, “We want to take forward the country” to make it a poverty and hunger free nation as dreamt by Father of the Nation Bangabandhu Sheikh Mujibur Rahman. “But a nation is unable to get rid of poverty and hunger without education. So we always give importance to education and teachers proactive role in this regard,” she said. 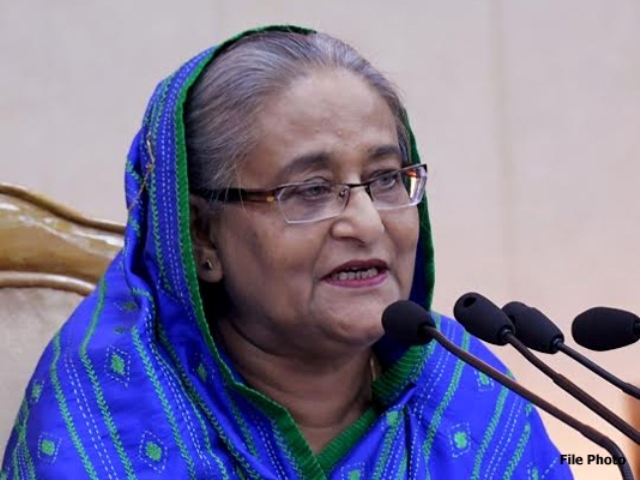 Sheikh Hasina said her government has already done everything that it should do for the teachers including their salary hike and service age limit. “Side by side we give importance to research through which we have made the country self reliant in food, fish, fruits and vegetable production,” she said. Instead of making the existing universities more crowded, Sheikh Hasina said her government is willing to build more universities in new areas to allow the students to have their higher education from their house. “It will also help the students to remain under vigilance of their guardians and society during their studies and debar them from being associated with militancy and anti-social activities,” she said. Sheikh Hasina said her government has brought the Madrasa education to the mainstream of the society, creating opportunities for about 15 million children to get the scope of higher studies.